Air France’s main pilots’ union ended its marathon two-week strike on Sunday, allowing a bitter feud over its low-cost subsidiary to continue in a calmer mood, albeit without a clear final resolution. The SNPL's spokesman Guillaume Schmid told AFP the pilots were ending the strike, which has cost the airline over 200 million euros and caused its shares to fall by 15 per cent. The crippling strike, which was the longest such movement since 1998, disrupted travel plans for thousands of people. Prime Minister Manuel Valls immediately responded to the news saying that he hoped all sides could "regain the confidence of everyone and resume the development of Air France and its subsidiary Transavia, which is an asset." The French government had called several times for the strike to end, saying it hurt the image of France as it was unbearable for travellers. Valls said on Sunday that the 14-day strike "penalised passengers, the company and the country's economy". Something of a change of tune for the government after it had refused on Saturday to name an independent mediator to settle the bitter feud over its budget subsidiary Transavia. In a “gesture of appeasement” the SNPL union had said late on Friday that it was ready to end the strikes as soon as the government named an independent mediator. The strike was initiated in response to the airline’s recent announcement of a major plan to expand its budget subsidiary Transavia via regional hubs around Europe to rival budget carriers like Ryanair. The billion dollar plan sparked the ire of Air France crew because Transavia pilots work on a different and less lucrative employment contract. The pilots wanted a single contract across Air France-KLM and its subsidiaries to avoid cutting salary and work benefits if they flew with Transavia. They also fear the airline would increasingly seek to replace the expensive Air France pilots, who can earn up to 250,000 euros a year, with less costly Transavia pilots. As a concession to the pilots, the company scaled back its plans insofar as keeping Transavia operations within France. However, it has maintained that it has the right to have varying employment contracts for those working at its budget subsidiary. Despite lifting the strike, Schmid said talks over the issue had reached an impasse early Sunday, with the latest round still not meeting the pilot’s demands. Air France flight schedules are expected to return to normal starting Tuesday. Air France said on Wednesday it would resume talks to solve a bitter and costly strike as confusion swirled over the fate of the low-cost subsidiary at the core of its dispute with pilots. The decision to pick up negotiations which hit an impasse earlier this week came as government urged a rapid solution to the longest strike in 16 years, which is costing Air France up to €20 million a day. We must "find a solution in the coming hours", Prime Minister Manuel Valls said, warning the 10-day strike was endangering Air France, Europe's second-largest flag carrier. As pressure mounted on management and unions to end the deadlock, confusion erupted after Transport Minister Alain Vidalies told French radio the airline had scrapped plans to expand its Transavia budget subsidiary. "The Transavia Europe project has been abandoned by management," Vidalies told RMC radio. But within minutes, an Air France spokesman told AFP it was "premature" to say the airline had buried the plans to develop its budget subsidiary, which it sees as vital to survive in the cut-throat world of low-cost aviation. "There is no change in the negotiations to suggest that this project has been withdrawn," a spokesman told AFP. "The proposal on the table remains to freeze this project and to begin a wide dialogue with social partners between now and the end of the year, as management announced on Monday," added the spokesman. An Air France spokesman later confirmed a return to the negotiating table "to reach a rapid resolution to the conflict", without giving further details. The pilots are striking in protest at the airline's plans to further develop Transavia, which currently serves holiday destinations across Europe and the Mediterranean. The pilots, who can earn up to €250,000 a year, fear management will eventually seek to replace Air France flights with those operated by Transavia, where pilots earn considerably less. "If abandoning or postponing the Transavia project allows for a solution to the crisis, it is the right solution," said Valls. The confusion between the government and management of the airline, which is nearly 16 percent state-owned, appeared to mirror the disruption that has gripped air travellers in France for more than a week. As in previous days, more than half of Air France flights were cancelled nationwide but the situation at some regional airports was much worse, with 80 and 70 percent of flights scrapped at the southern airports of Nice and Toulouse respectively. However the strike was not universally supported. Hundreds of Air France employees rallied in front of company headquarters on Wednesday demanding that pilots get back to work. "I don't understand the intention of my fellow pilots, I don't understand why they are striking against growth," said Jerome Cormouls, captain of an Airbus A320. In what it described as a "last" offer to break the deadlock, as the strike stretched into a second week, management on Monday offered to put the Transavia project on hold until December. But unions dismissed this as a "smoke screen" that would not protect jobs in France. The strike is already the longest at the airline since 1998 and management warned it will have a major impact on profits. Unions have threatened to extend the action until Friday if their demands are not met and pilots marched through Paris in uniform on Tuesday. The government has called several times for the strike to be halted, with Valls previously warning that the image of France was at stake. Vidalies on Wednesday again asked pilots to return to work, saying "there is no longer any reason for the strike to continue". [It has become increasingly difficult for me to avoid passing comment on this strike. This is an incredibly competitive industry where historic customer loyalties have been cast aside in favour of low-cost pan-European travel. Air France is not the first of the so-called flag carriers to find itself out of sync with current market demands. There is little or no evidence of one of the airline monoliths thriving, let alone surviving, without deep and fundamental change. The Transavia and Hop! initiatives represent the kind of strategic shift that Air France-KLM needs to make in order to re-position itself for the next 20 years. The Air France pilots know this all too well, and are holding the company hostage in what might be a last stand. At stake, for both sides, is the ultimate survival of the business. The pilots can't afford to stand down because they face job loss or a 60% pay-cut. The company Board can't afford to step down because if they do, they simply hasten the end of the airline and destroy their last lifeline - and with it the future jobs of the pilots who oppose the transition. Competitive activity in the European single market is callous and harsh; French protectionist policies cannot hold back the threats of Easyjet, Ryanair and most recently, Norwegian Airlines. Nice Côte d’Azur Airport has signed a partnership agreement with leading internet search engine Google, to test the latter’s Indoor Maps technology (geolocation inside buildings). Indoor maps of Terminals 1 and 2 (landside and airside) at Nice Côte d’Azur Airport are now available and viewable via Google Maps. Currently in the test phase, this new technology aims to guide passengers, simplifying and optimising their movements by indicating certain points of interest inside the airport: check-in counters, security checkpoints, walkways, shops and businesses, toilets and other specific services. Passengers can therefore learn about and plan their itinerary through the terminals, level by level, and locate themselves in real time by enabling geolocation on their mobile devices using the Google Maps application (available via IOS and Android). 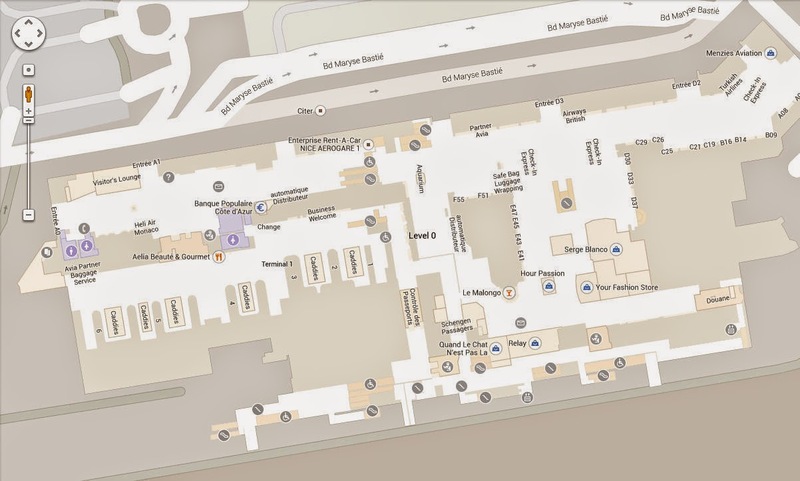 In November last year London Gatwick Airport announced that Indoor Maps and Indoor Streetview would be available across its public areas – the largest such implementation in Europe at the time. As the Air France pilots' strike grinds into its ninth day, there is little hope that unions and management are close to a deal. Over half of the airline's flights remain grounded. French Prime Minister Manuel Valls warned of a "real danger" for Air France as a pilot strike that has grounded more than half its fleet deepened Tuesday after talks hit an impasse. The strike over plans to expand the company's budget airline Transavia in Europe entered its ninth day at a cost of €20 million daily. "There is no reason for this strike. It is jeopardizing the image of France and represents a real danger for Air France," Valls told Europe 1 radio. "This strike must stop. Management has made a number of proposals and it seems to me the conditions are in place for the positions of either side to come together." There was brief hope of a breakthrough Monday after the company offered to freeze the development of Transavia, seen as vital to compete in the cut-throat aviation sector. Alexandre de Juniac, chief executive of Air France-KLM, Europe's second largest airline after Lufthansa, said this was the "last offer" to break the deadlock that has grounded on average 60 percent of the fleet. However, the main pilots union rejected the offer as a "smoke-screen that offers no more guarantees than previous offers and does not solve any problem." The longest strike at Air France since 1998 "has had disastrous consequences for customers, employees and the company's finances," the airline said. Pilots are due to stage a rally, in uniform, near the National Assembly lower house of parliament on Tuesday afternoon. They fear the airline will seek to replace expensive Air France pilots, who can earn up to €250,000 a year, with Transavia pilots, who are paid considerably less. Unions have threatened to extend the strike until Friday unless their demands are met. Pilots at Air France have voted to continue their strike for a second week with the company cancelling more flights on Sunday than on preceding days. In a postal ballot 80.9 per cent voted to continue striking until Friday 26 September, the SNPL union announced on Saturday, reporting a “historic” tournout of 73.71 per cent. Another union, the Spaf, on Friday extended its strike call for a further two days. Air France said that, with 65 per cent of pilots on strike on Sunday, it would have to cancel 62 per cent of its flights on Sunday, compared to 55 per cent on Saturday. The unions have accused the company of playing down the number of strikers. Services of French airports were badly hit at the weekend, Marseille seeing 81 per cent of flights cancelled on Saturday and Lille cancelling all flights on Sunday. The SNPL has asked for a meeting with Prime Minister Manuel Valls, who called on them to end their strike on Friday. Unions believes the company wants to relocate jobs on the low-cost arm Transavia to countries with worse wages and conditions. Air France accuses the unions of not wanting to negotiate. [Guess that means the Easyjet Montpellier-Gatwick flight will be full again on Monday! Sixty percent of Air France's flights are slated to be cancelled on Tuesday, up from 50 percent on Monday, due to a pilots' strike that is expected to continue until at least Friday. Stranded passengers were already stacking up at airports. Stranded passengers voiced outrage on Monday as French flag carrier Air France scrapped half its flights due to a pilots' strike in protest of company plans to expand its low-cost subsidiary Transavia. Air France warned that disruption would only get worse as the week went on, with 60 percent of its flights likely to be cancelled on Tuesday. Fears were mounting that the planned week-long protest, the longest at the company since 1998, could spell travel mayhem across the country. The strike sparked anger among passengers stranded by the stoppage, with Jean-Marc Ragot arriving in Paris from Nairobi only to find his connecting flight to the eastern French city of Lyon cancelled. "I can't return home, thanks!" he complained at Charles De Gaulle airport. "I've had it up to here with strikes in France. One always has a problem when one returns home," he said. Alexandre de Juniac, chief executive officer of the Air France-KLM group, which also includes the Dutch airline, warned the strike could eat into Air France's profits. "Air France should make profits this year if the strike does not have an impact on its efforts," he said. Air France said it had sent 65,000 text messages to alert passengers affected by the strike called by its main pilots' union SNPL, and deployed some 7,000 extra workers to help stranded customers. Munich-bound Carlos Gomez received such a message but turned up at Paris's main airport anyway despite all flights to the German city being scrapped. "I simply have to get to Munich today and I have to find a solution," he said. At Paris's main Charles De Gaulle airport, 212 Air France flights were cancelled on Monday out of some 500. But flights elsewhere were worse hit with 80 percent cancellations in the southern city of Toulouse, and 70 percent in Marseille, Lyon and Nice. On Tuesday "40 percent of the flights will be maintained", Air France's director of operations Catherine Jude told reporters. But a pilots' union warned that eight out of 10 flights could be cancelled as the strike continued later into the week. The company urged "customers who have booked a flight between September 15 and 22 to delay their trip, change their ticket free of charge or claim a refund." Unions fear that expanding Air France's low-cost operation Transavia will lead to "jobs being outsourced" and "social dumping" with pilots being employed on local contracts. Air France boss Frederic Gagey put the daily losses from the strike at "€10 to 15 million" and said management was "doing everything with the social partners to try and find a way out of this situation." Passengers whose flights are cancelled will be fully reimbursed while the compensation for delayed flights will range between €250 to 600. Unions warned the transport situation would be even worse on Tuesday and Wednesday as the pilots who did decide to work on Monday would have to take their legally stipulated rest. The company said: "If the strike continues beyond September 15, the flight schedule will be modified as a result. The knock-on effects will be communicated to passengers the day before they are due to leave." Seeking to take advantage of its rival's woes, low-cost airline easyJet on Saturday laid on 1,000 extra seats on flights from Paris to the southern cities of Toulouse and Nice. An Air France pilot earns about €75,000 a year on average while captains of long-haul flights can earn up to €250,000. With negotiations sputtering, it’s looking increasingly likely that Air France pilots are going to carry out their threat of a “massive” walkout today. Their unions have called for a week-long strike over re-organization plans. If you’re planning on taking an Air France flight this week, it may be time to start thinking about alternatives. Pilots have said they will strike today, unless Air France management finds a way to assuage their concerns over the company’s plans to hire hundreds of new pilots in coming years, who could have lower pay and benefits. As the weekend approached things weren’t looking good. Air France said talks scheduled on Friday were cancelled, though the flagship French carrier insists the dialogue remains open with its pilots, French daily Le Parisien reported. But union reps are already saying this could be the biggest pilots’ strike at the airline since 1998, which cost the company millions of euros. The legal deadline for their 48-hour strike notice is Saturday, which is when the size of the potential action will become clearer. Air France has already started telling customers who’ve booked flights for next week that they cancel or exchange tickets at no cost, so it's clear that the airline is expecting trouble. At issue is a plan by Air France to invest heavily in its low-cost carrier Transavia. The airline plans to grow the carrier’s fleet from its current 14 plane to 37 and hire 220-250 new pilots by 2019. The unions want Air France to promise the new pilots will get the exact same pay and benefits as the existing workforce, but the airline has categorically refused to do that. Coming on the back of Air France's news, Lufthansa says a pilots' strike has meant cancelling 200 flights and that the stoppage has also hit the travel plans of about 25,000 passengers. A second pilots’ union has joined calls for a strike at Air France on 15-18 September. Like the largest union at the company, the SNPL, it wants the same conditions for pilots in all branches of the company. Montpellier's Méditerranée Airport traffic rose by more than 5% in July 2014 compared to 2013. July 2014 saw the largest in terms of passenger volume for July since 2002, with 162,441 passengers travelling through the terminal. For internal flights, overall traffic was down 4.4% on the month. Traffic to Paris (Orly and Roissy CDG) was stable compared to 2013. Other domestic routes to Ajaccio, Lyon, Lille and Strasbourg are all down - except Nantes, up nearly 18%. It was the European sector which was driving the growth in July. Here, traffic was up over 31% year-on-year, probably due to the 7 new services introduced during the season and which operated in full in July. With the exceptions of Frankfurt-Hahn and Rotterdam which are down this month, all other European routes posted gains: Leeds-Bradford +13%, Charleroi +27%, Copenhagen +56%, London (Gatwick and Luton) +4.8%, Munich +18% and, best of all, Rome increased by a massive 277%. The new lines created to Europe (Düsseldorf by Germanwings, Frankfurt by Lufthansa, Brussels by Brussels Airlines, Mulhouse by easyjet) collectively generated a volume of more than 8,500 passengers, around 5% of the overall volume. International flights are down this month by 18.6%. Only Algeria bucked the trend by posting a 41% increase; Morocco is down 26.8% despite the recent arrival of Royal Air Morocco's route to Casablanca. As at the end of July, the cumulative growth in passenger traffic at Montpellier Méditerranée Airport is 4.65%, placing the airport in the upper quartile of French airports' passenger growth results.